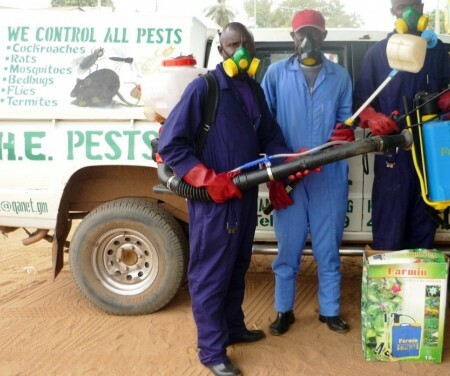 Gambia Horticultural Enterprises (GHE) with support from The Youth Empowerment Project (YEP) is offering an 5-week on-the-job training programme in pest control for Gambian youth. The training programme will be highly participatory with both theory and practical elements, including classroom, workshop, factory and field work. The training programme will be conducted in English, Wolof or Mandinka depending on the preference of trainees. All materials and equipment required for the training programme will be provided. The programme includes a 1-week training on entrepreneurship and business skills. Trainees will receive a stipend during the course of the training. For the Pest Control Training Programme, the stipend will be D 3,000 for youth from GBA and D 5,000 for youth from all other regions. Successful trainees will be able to apply for start-up support after completion of the training. • No prior experience is necessary but applicants must demonstrate a strong interest and desire to undertake the training. • Rural youth, returnees and school leavers are particularly encouraged to apply. A minimum of 50% rural youths will be selected. Application Forms are available at all Regional Agricultural Offices, all GHE outlets and training centers, and online on the YEP Portal. You can download it here. Alternatively, the form can be scanned and sent by email to yep@intracen.org and gamhortmc@gmail.com. Application Deadline: Wednesday 20 June 2018 at 11.59 pm. For any enquiries, please contact: yep@intracen.org or gamhortmc@gmail.com.